Whether you’re a preschool teacher, parent, or caregiver for young children, reading aloud is one of the most important things we can do to nurture the growing minds of young children. But reading books is about so much more than brain development. It creates a wonderful bonding experience between adults and children, teaches kids that books are an important part of daily life, helps them with writing as they get older, and fuels their imagination as they experience the power of story. School Readiness Superheroes: PARENTS, the greatest superheroes in the universe! 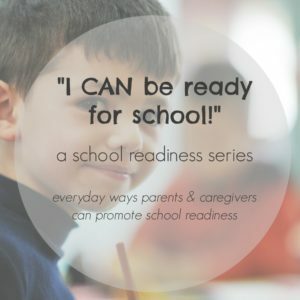 But what is true school readiness? That’s what we’ve been talking about the last couple of weeks on the blog. With back-to-school events right around the corner, it’s officially time to start getting ready for the fall schedule. But what is true school readiness? That’s what we’ve been talking about the last couple of weeks on the blog.